The nervous system of the leech is said to be very similar to the human nervous system. As the pictures in Figure 1 and 2 show, the nervous systems of a leech and human have some similarities, the most obvious is the central nervous tissue and ladder-like nerve network. 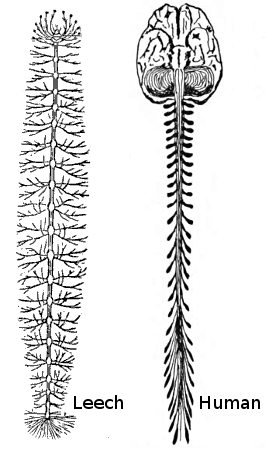 Figure 1: This image shows the nervous systems of a medical leech and a human, side by side, illustrating that the basic segmental structure of the bilaterian nervous system is apparent in both. These similarities are of enormous benefit to researchers in their quest for the answers to human problems. The medicinal leech Hirudo medicinalis can completely repair its central nervous system (CNS) after injury. This invertebrate model offers unique opportunities to study the molecular and cellular basis of the CNS repair process. 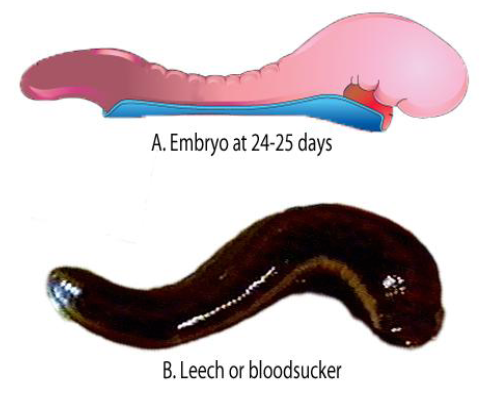 In humans, the development of the CNS starts with the formation of the neural plate about the 18/19th day post fertilization (Figure 4) – the time when the embryo begins to acquire the shape of a leech (Figure 3). Formation of the neural tube. Human embryo – day 19. The first sign of the developing nervous system is the neural plate. Human embryo – day 20. A “trench” is formed in the neural plate – this creates a neural groove. Human embryo – day 23. The shape of the embryo’s entire body is tubular. 1. Biopharm Leeches: http://www.biopharm-leeches.com/links.html (accessed 30 June 2013). 2. Human-Leech Nervous system: http://commons.wikimedia.org/wiki/File:Human-leech-nervous-system-comparison.png (accessed 30 June 2013). 3. The medicinal leech, once used in medicine to draw blood from patients, may provide new clues to neural regeneration. Purdue researcher Christie Sahley and her research assistant, Orie Shafer (background) are using the leeches to analyze the role nitric oxide synthase may play in neural regeneration. Medicinal leech may offer clues to neural regeneration, Purdue News, 1996. (Accessed 26 July 2013). 4. Gonzalo Moscoso: Structural Development of the CNS, Chapter 2: Early Embryonic Development of the Brain. (accessed 30 June 2013). 5. Neuroscience For Kids: http://faculty.washington.edu/chudler/dev.html (accessed 30 June 2013). QUR’AN IS A MIRACLE FOREVER.